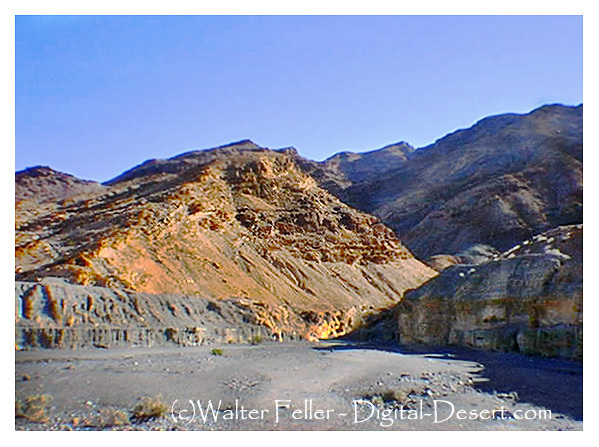 The entrance to Mosaic Canyon appears deceptively ordinary, but just a 1/4 mile walk up the canyon narrows dramatically to a deep slot cut into the face of Tucki Mountain. 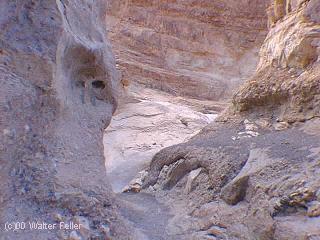 Smooth, polished marble walls enclose the trail as it follows the canyon's sinuous curves. 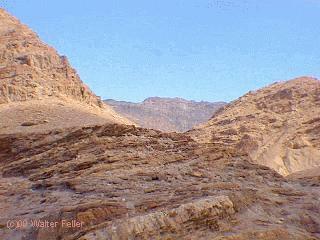 Following faults The canyon follows faults that formed when the rocky crust of the Death Valley region began stretching just a few million years ago. 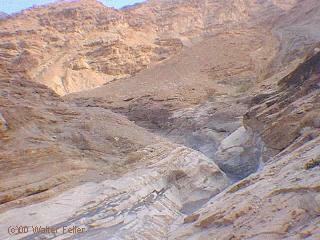 Running water scoured away at the fault-weakened rock, gradually carving this remarkable canyon. 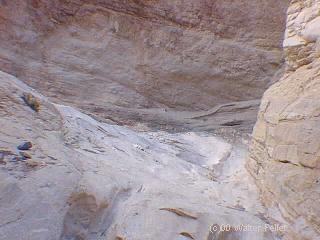 Periodic flash floods carry rocky debris (sediment) eroded from Mosaic Canyon and the surrounding hillsides toward the valley below. 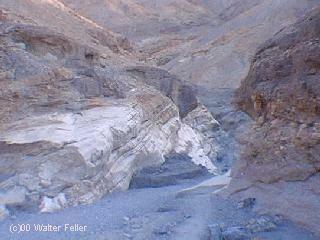 At the canyon mouth water spreads out and deposits its sediment load, gradually building up a large wedge-shaped alluvial fan that extends down toward Stovepipe Wells. 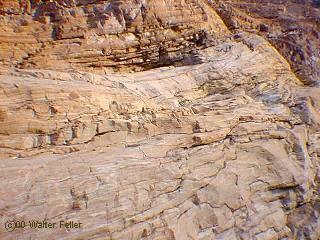 Mosaic Canyon's polished marble walls are carved from the Noonday Dolomite and other Precambrian carbonate rocks. 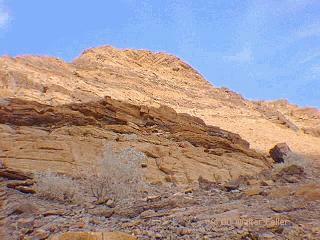 These rock formation began as limestone deposited during Late Precambrian (about 850-700 million years ago) when the area was covered by a warm sea. 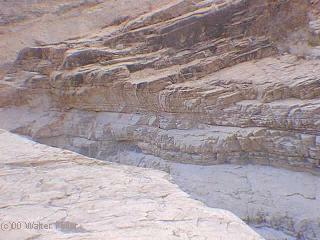 Later addition of magnesium changed the limestone, a rock made of calcium carbonate, to dolomite, a calcium-magnesium carbonate. 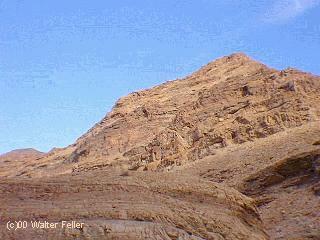 The dolomite was later deeply buried by younger sediment. 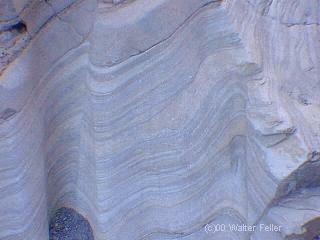 Far below the surface, high pressure and temperature altered the dolomite into the metamorphic rock, marble. 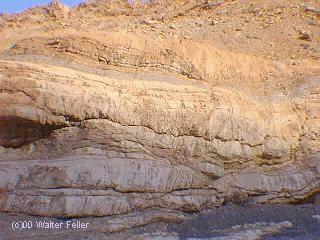 The relatively recent uplift of Death Valley's mountian ranges and subsequent erosion have exposed these metamorphic rocks. 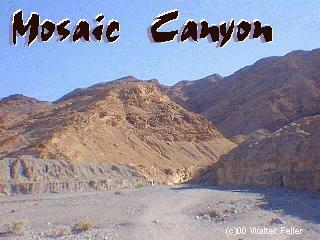 Mosaic Canyon was named for a rock formation known as "Mosaic Breccia". 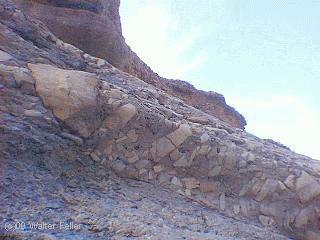 Breccia is the Italian word meaning "fragments". 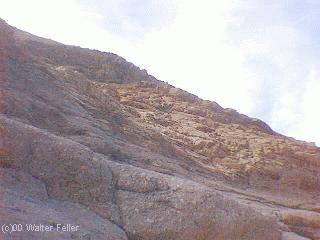 The formation is composed of angular fragments of many different kinds of parent rock. 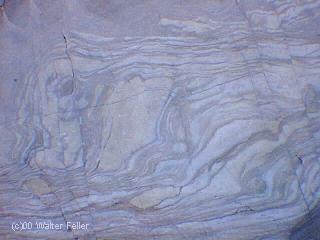 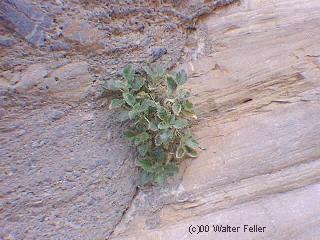 Surrounding canyon walls are composed of smooth water-polished marble. 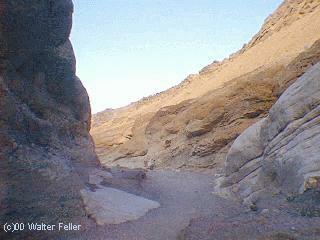 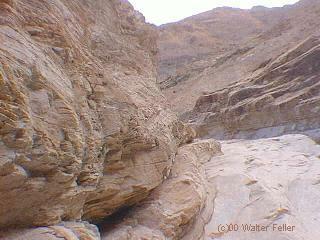 the geologic formation of mosaic canyon in death valley national park. 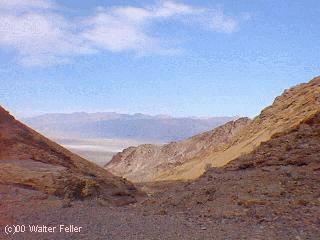 The geology of Mosaic Canyon, Northern Panamint Region, Death Valley regional field guide.